At the age of 46 years general de Lambert is still a bachelor, his health already ruined. As a great lover of horses he got acquainted during the years of 1833-1835 with the famous equerry Louis-Stanislas Savary count de Lancosme-Brèves, while he visits all European riding academies. A joint passion and blood ties – Lancosme-Brèves and de Lambert were related twice through the Anisson-Duperron and the de Menou family – united both men and they started exchanging letters. So it is logical that when the general returns to Paris he finds shelter with the Lancosme-Brèves who live on 9, rue Richepanse, the apartment just above the one of count Ferdinand Marie de Lesseps, the inventor of the Suez-canal. Charles-Alexandre (Karl Karlovic) count de Lambert, on the advice of doctors who recommend residence in a milder climate, decides to settle down on Madeira. He stimulates his friends Louis-Stanislas Savary count de Lancosme-Brèves – depressed by his political failures and tired by financial problems – and his, as an amateur painter talented wife, countess de Lancosme-Brèves born Marie-Antoinette Juliette Gaudar de Laverdine, to accompany him an they accept ‘the exile’. After earlier visits to Lisbon, London and Madeira the count definitely resides in September 1863 in Madeira’s capital Funchal and rather in Rua Ponte S. Lazaro. In March 1864 he buys for 9.000.000 ruis the ‘Quinta das Augústias’ at Rua da Imperatriz D. Amélia, possibly called so on account of the fact that the chapel which is connected to the main building, honours ‘Nossa Senhora das Augústias’. Then in October that year he becomes owner of a part of a terrain situated next to it where the villa, renamed ‘Quinta Lambert’, situated at a height of forty meters gives a splendid view of the sea. 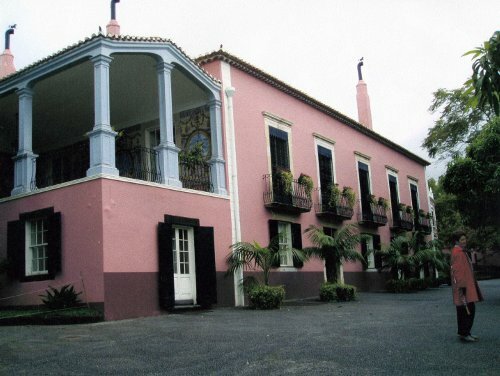 From the beginning of May 1984 it is, under the borrowed name of ‘Quinta Vigia’ (the former ‘Quinta Vigia’ was demolished twenty five years before to make place for the casino and the hotel Casino Park) in the beautiful Parque de Santa Catarina, the official residence of the Regional Government of Madeira. In a glass fronted garage a reputed possession of Charles-Alexandre count de Lambert, a car, is still on display.